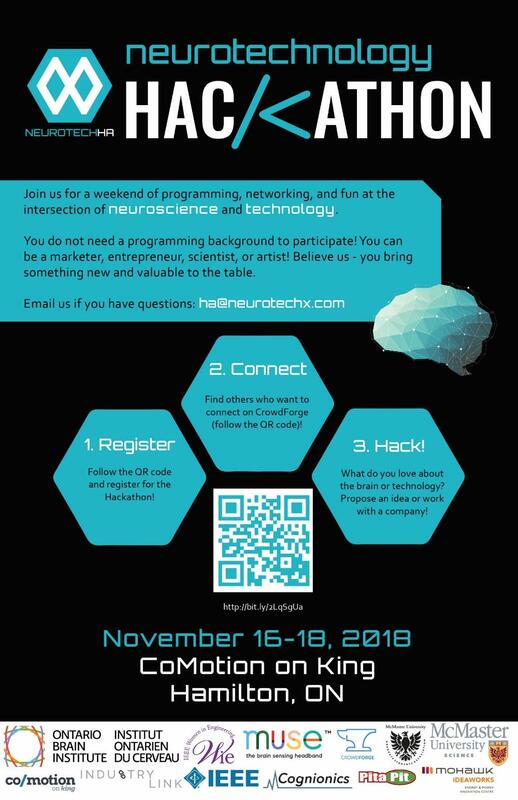 We are thrilled to present to you NeuroTechHa's first Hackathon! Join us for a weekend of programming, networking, and fun at the intersection of neuroscience and technology. The goal of the hackathon is to bring together people with different backgrounds to further develop the neurotech ecosystem in Hamilton. We encourage EVERYONE to participate, even if you do not have a programming background. Believe us, everyone brings something new and valuable to the table. To join or create a team of your own, visit Crowdforge to get an early headstart. For more information/ticket sales, please visit the Eventbrite page. If you have any questions, send us an email: ha@neurotechx.com. You can also contact or follow us on our social media pages, Twitter or Facebook (@NeuroTechHa).